It is easy to understand that this web was unnecessary a few decades ago as teaching and learning this craft in an explicite way. In the "esparto culture" all was integrated in such a way that we didn't need a determinate period of time to teach and learn it. This was done here and there in the comes and goes in the everyday rhythm of work and rest, alternating days and nights, in the middle of the seasonal cycle of winter and summer. At the same time, the esparto knowledge was transmitted in the everyday rhythm of work and rest and it didn't seem very necessary to go out and look for anything else. Actually daily life makes it necessary to take time and space to teach and learn deliberately these snippets of tradition, because in the acceleration of daily life nearly without noticing we lost this natural transmission of craftsmanship. This is the reason that I offer here the possibility to approach and teach (worldwide) diverse esparto weavings as I have been compiling and receiving knowledge from my teachers, a lot of them with their warm presence. Activity: we will work with the crushed esparto and weave, at least, two pieces shown here. 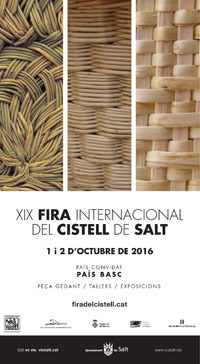 You will learn to braid a cord and learn to weave recincho (or cerneja rope). Estimated time: about 15 hours. Activity: ;we will work with crushed esparto (picao). It is about how to cover a bottle, a carafe or weave a vase. The objective is learning how to lift the "wall" of the piece. We learn other types of weaving like the seven strands thread, the four strands small threads (rabogato), and also the 5 strands and 8 strands ones. Weaving sandals of esparto is one of the most laborious activities the esparto craftsman is confronted with. To weave them ask a certain amount of will and tenacity from us because long threads and "recinchos" are required. This activity is dissapearing because of its complexity. 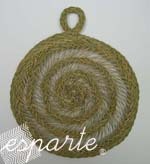 Activity: to weave a pair of esparto sandals. Estimated time: about 40 hours. To say "pleita" in esparto craftsmanship is saying a lot. Pleita is the work par excellence. If tidiness and coherence presides our work it is not a very difficult weaving. Activity: the work is to begin weaving the very strap of pleita with what we will weave a tablemat. In this course we learn how to start pleita with some delicacy and simplicity. Estimated time: about 18 or 20 hours. There are many pieces that can be woven with pleita but the mayority of them can be collected in two groups: flat work and works with weaving in height. In this course we will learn how to work in height. 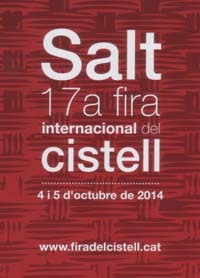 Also we will learn how to pass from 15 to 17, 19 to 21 strands in a tidy way and without stridences. Activity: we will weave a breadbasket or a medium bowl. In this course, the difficulty is in the combination of flat weaving and working giving height to the piece. Also we have to add the complexity to sew with an incorporated piece (carafe). And to cover the "neck" adds another difficulty. 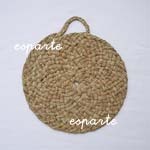 Activity: We will wrap a carafe with esparto "pleita". Estimated time: about 20-25 hours. It is a practical and simple piece that nowadays can be integrated into domestic and semi-rural environments as we try to bring this athmosphere at our homes. Activity: elaboration of a lamp. Estimated time: about 10 or 12 hours. This course can be integrated in other pleita courses. The "serón" is a piece that truly has fallen into disuse but there is always a group or some people interested in this work. This course can be incorporated in another when the organization requires it. It doesn't require special skills if the pleita weaving is well known. Activity: elaboration of a "serón". Estimated time: about 10 hours (plus the weaving of pleita and cords). It can be incorporated in other pleita courses. It is the typical work to braid a shallow basket used formerly in the olive oil mills to press the olive mass or in cellars to press the grapes in the wine culture .It is not a difficult stitch but requires hands to handle the few stitches that requires going to the right place well. Activity: we will braid a tablemat with the "cofin" stitch. Estimated time: about 12 or 14 hours. Once we dominate the cofin stitch, weaving a wall with this stitch is easier. It is true that it requires modes and forms. Activity: development of a bread basket with the cofin stitch. Estimated time: about 10 hours. The course of cofin mats and cofin bread baskets can be integrated into longer courses of about 25 hours. The "cachulero" or "cernacho" is a typical piece in the East of Spain, concretely at the Southeast. It is a labor that asks skill and control of the "cofín" stitch, here used to create a snail basket, we use a special cofin stitch to make these baskets. 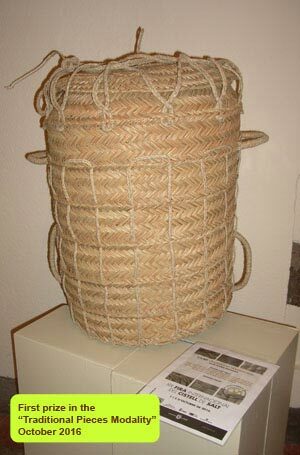 Activity: elaboration of a "cachulero" or "cernacho" (a basket to collect and keep snails). Estimated time: about 16 hours. It is easy enough to make this work and it can be attractive for the spiral forms that it defines. We don't need very big efforts to weave it. It is frequent to find it in the cover of bottles and carafes. Activity: covering of a small bottle. Estimated time: about 6 hours. This course can be integrated in some of the previous ones. It is a survival and defensive tool that have fallen in disuse because of the disappearing of shepherds (the majority of them used it to work with the herd) . In spite of this, nowadays there is some interest to recuperate it, even it has become a federated sport in some places in Spain. Activity: : elaboration of one or some slings. Estimated time: about 4 hours. Coiling is the traditional way for weaving beehives, that's why it's also called the beehive stitch. It’s just sewing in spiral a bunch of esparto leaves, every turn over the former one.The beehive stitch is an easy one. Originally, they did this with straw. Its flexibility allowed it's easy management. Where no straw was found, they replaced it for similar materials like esparto. These kind of labors are of a great consistency. Activity: weaving of a tablemat or a small bowl using beehive stitch (coiling). 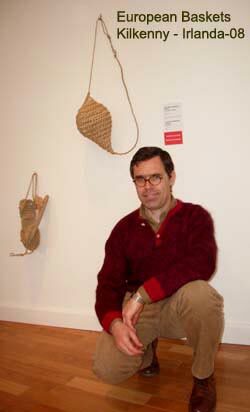 It is a work that can be in some way a transition between esparto and wicker basketry. Both ways of weaving are similar. The only difference is in texture and "behaviour" of each material. Both works share one mode of weaving. At a certain moment they distance themselves: when finishing the weaving or modifying some of the principles to perform some aesthetical adaptations. Activity: to weave a bowl with "Comb stitch". Similar work to recincho although woven differently. Activity: we will weave a small table mat. Estimated time: about 10 or 12 hours to simple labour. The wicker basketry is somewhat different from the esparto weaving, except of comb woven. In this first initiation course we will learn the elemental technics to begin. We will weave a base and raise the "wall" with simple rods. 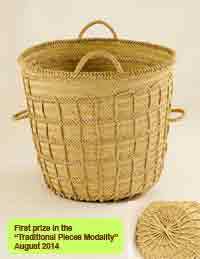 It is a basic course in classical basket making. Activity: weaving of a small bread basket. 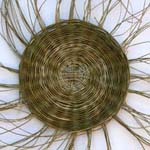 In this second wicker basketry course, we incorporate some new technics to begin a basket. 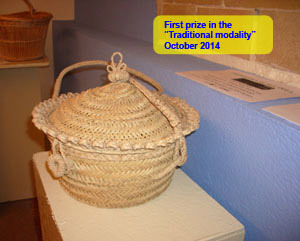 New modalities to weave a basket base, adornments, edges, weavings and decorative closings. 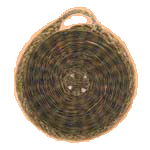 Activity: : weaving of an oval bread basket and a closed basket with a flat closing and French lace. 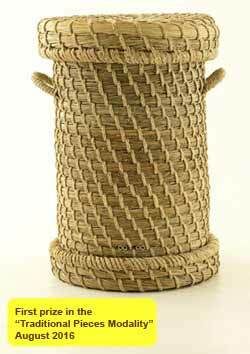 Wicker basketry is relatively different from weaving esparto except twinning esparto. 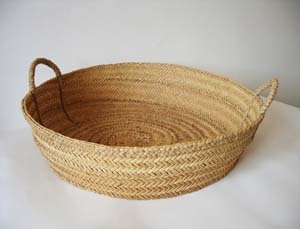 In this course the basic techniques of basket weaving are practiced. We will weave a base and the wall will rise with simple rods. The closure will be a string of two branches. 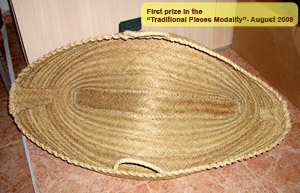 Activity: we will weave a small basket with central handle. For any questions you can go to the web form.